Reward Me has now the registration open for free samples with free delivery offer. Register now as Reward Me member only privileges. 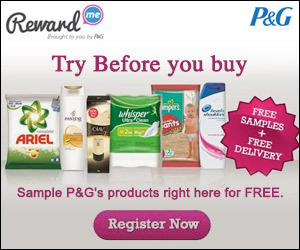 It's super easy and only takes a couple of minutes to avail FREE rewards from P&G. How to register for Reward Me Free samples? 1. Visit Reward Me offer page here. Verify your mobile number using the verification code you receive in your mobile. 2. Choose the products which you would like to try as samples from Reward Me. Ariel, Pantene, Olay, Whisper, Pampers, Head & Shoulders are some of the products available as samples to grab. That's it. You will get the samples delivered for free at your doorstep from Reward Me. 1. The offer is available only for new users with new email id and new mobile number. 2. Hurry up to avail the free samples from Reward Me before it is stopped.